Gwinnett pitcher Todd Redmond and first baseman Ernesto Mejia were named International Pitcher and Batter of the week, respectively on May 21 for their performances for the week of May 14-20. Redmond posted a 2-0 record and a 0.69 ERA during that span and took home the honor for the fourth time in his career. Mejia became the second G-Brave this season to claim the Batter of the Week award, with Stefan Gartell being the other recipient for the week ending on May 6. Mejia hit a league-best .464 during the week, which boosted his team-leading average past the .300 mark, while also driving in seven runs. 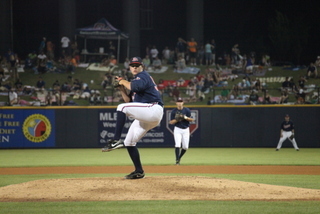 The sweep of the two weekly awards is the first in Gwinnett Braves history.